Buying a new wooden shutter for your exterior installation is certainly expensive. It really depends upon your budget, however, the cheapest you can get is $100 for a pair, and if you are ready to spend a good amount then it may even cross $300 a pair. Now that is indeed expensive. Not everyone can spend that much. If you think a little, then you may come up with something new. 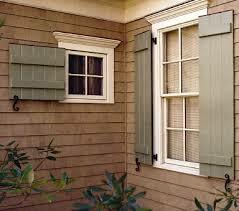 How about designing cheap exterior wood shutters? If you have never given a thought about it, it’s time now to be creative and original. It doesn’t matter whether you design your own, or buy a new one, these wooden shutters come with a lot of benefits. one of the major advantages of using exterior wood shutters is the fact that they match any decor that the wall may have. You may have a blue wall, and these shutters go well with it. In fact any design matches wooden shutter. This explains why so many houses around have wooden shutters. Don’t make the mistake of making the wood elaborate. Once you do that the charm of using wood as shutters simply vanishes. You must remember that plain wood is very attractive, and easily creates a liking in the eyes of visitors. It is also a very viable option for any window treatment you may think of. Wooden shutters give you a fully fledged protection in all seasons. In summers in particular, it can block sun rays at once, not allowing any part of sun rays to enter your house. Even during winter season, exterior wooden shutters work best. The cold can’t leak through, and it’s top class protection. These shutters also cope well with rains. You must choose good wooden shutters to protect the wood from getting spoiled during rainy season. In summer the wooden shutters can be attuned to allow air to enter the house, which is one of the beneficial features of wood shutters. Similarly, exterior wooden shutters are also quite helpful to receive sunlight. Sunlight is an essential part of our well being. And the wooden shutters can be attuned in a particular way to receive sunlight inside the room, without even opening the full window phase. No one will have to wash the windows every day. The wooden structures are normally dust free. You may use a duster to wipe out the dust every morning, or twice a week. But the use of soap or any cleaning agent is not advised. Even water should never be used. There is no other maintenance to manage wooden shutters. The final advice is to choose a colour that contrast with the colour of the wall, but yet looks good. You may also use glass panes on the top tier of the window to make it easier to have an outside view. If you do that ensure that glass pane only cover 30 percent of the structure.